OAKLAND, Calif. -- Practice doesn't make perfect. Perfect practice makes perfect. That epithet is spewed at all levels of pretty much all disciplines, but it rings true in the NBA playoffs. The Warriors could have beaten a lot of teams 4-1 in the first round, but not all opponents are created equal, nor are all wins, and Golden State's opening series against the Spurs was exactly what they needed to kick off their quest for a fourth straight NBA Finals appearance. The Warriors put the Spurs to bed on Tuesday with a too-close-for-comfort 99-91 Game 5 win, and while it will go down as a gentleman's sweep in the record books, the series could prove to be incredibly valuable to a Warriors team that was struggling to find its identity following a pedestrian end to the regular season. By virtue of the draw that played over the final weeks of the regular season, the Warriors were paired up with the perfect opponent -- a team that would test them and force them to play the right way, but also a team that had absolutely no prayer of beating them in a seven-game series. San Antonio emphatically checks both boxes. The main reason the Spurs weren't a threat, of course, is because their best player didn't play -- and wasn't even in the building -- for the entirety of the series. Kawhi Leonard was off in New York with "his group," and it was reported after Game 1 that Leonard would miss the rest of the postseason, which effectively spelled game over for San Antonio. But even though they made short work of the Spurs, Golden State still came away with some important lessons that will help them next round against the piping-hot New Orleans Pelicans, and possibly beyond. First, Golden State got to test itself against one of the best defenses in the NBA. Even without Leonard, this Spurs group is disciplined, aggressive and physical ... and they came to compete from start to finish in every single game of the series. Klay Thompson had to work relentlessly off of screens to shake Danny Green, Patty Mills, Dejounte Murray and their other perimeter defenders, while Kevin Durant had to find other ways to score when San Antonio effectively moved him off of his favorite spots on the court. The Spurs also made Golden State work on the other end. While some teams get by on talent and figure out the rest later, San Antonio is the exact opposite, implementing a system so resolute that it can operate with interchangeable parts, no matter the talent level. The Warriors defense, which had been lackluster at best for the second half of the season, had to intensify or risk being exposed by the Spurs' exemplary execution. "The Spurs always make you do the right things," Warriors coach Steve Kerr said after the game. "You will be exposed if you're not attentive and boxing out and rotating and taking care of the ball. ... Our team struggled coming into the playoffs, so the Spurs helped us kind of get our game back, in terms of forcing us to defend and pay attention to detail. ... Their guys just fought like crazy and made us earn everything we got." Perhaps most importantly, however, Golden State got to test out its ace-in-the-hole Stephen Curry-less lineup with Andre Iguodala at point guard. 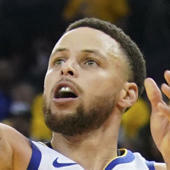 Quinn Cook had started the final 10 games of the regular season with Curry on the shelf, but Kerr pulled a rabbit out of his hat in Game 1 against San Antonio with a starting lineup of Iguodala, Thompson, Durant, Draymond Green and JaVale McGee -- which hadn't played a single minute together all season -- and stuck with it throughout the series. Getting the opportunity to work out the kinks against an aggressive Spurs team could prove crucial for the next round, when the Warriors could be without Curry once again for part or all of the series. Kerr said before Game 5 that Curry is "day to day," but the consensus is that they're not going to rush him back. That means Curry could miss multiple games against New Orleans, so the new starting lineup's test run against the Spurs only improves their chances of starting strong against the Pelicans. Kerr may choose another starting lineup to begin the second round, but at least now he knows that this is a group he can go to with confidence if the need arises. Lastly, while LaMarcus Aldridge and Anthony Davis are completely different beasts, the Warriors at least got some experience attempting to contain a dominant big man. Bigs like McGee and Kevon Looney got acclimated to the physicality of the NBA playoffs, which makes them better served when they're needed to body up Davis -- and they will be needed. "I really appreciate the way that [the Spurs] battled out there," McGee said after Game 5. "They kind of, like, hit us in the mouth, like, 'wake up, it's not gonna be easy.' We have to take that as a bump on the head. In this next round we can't take any possessions off. We can't take anything for granted. We have to go out there and really play our hearts out." Overall the Warriors couldn't have asked for a better first-round opponent. San Antonio forced them to work hard, make adjustments and rise to playoff-level intensity. If the Warriors continue on the path to yet another NBA Finals, they can look back on this series and thank the Spurs for helping them get there.